Sterilization equipment and disinfectants are essential procedures for infection control in healthcare facilities such as hospitals, clinics, and laboratories. In terms of revenue, the global sterilization equipment and disinfectant market was valued at above US$ 4,400 Mn in 2017 and is anticipated to reach US$ 6,500 Mn in 2026, expanding at a CAGR of 4.5% from 2018 to 2026. Increase in hospital-acquired infections has compelled medical professionals to take stringent regulatory actions in order to cure these infections with the usage of various sterilization equipment and disinfectants. This factor is anticipated to propel the sterilization equipment and disinfectants market during the forecast period. Globalization leads to the outbreak of several diseases, and some of them are lead to surgery. According to the annual plastic surgery procedural statistics, there were almost 15.9 million surgical and minimally-invasive cosmetic procedures performed in the U.S, in 2015, a 2% increase over 2014. This increasing number of surgeries is creating a demand for more sterilization of equipment in order to prevent any microbial infection. A large number of global manufacturers are putting constant efforts to develop and manufacture novel equipment so that the customer can carry out the sterilization process more effectively and smoothly. Demand for low temperature sterilization for moist and heat-sensitive equipment is rising. Key players are focusing on the development of new sterilization equipment and disinfectants with better efficacy. For instance, Becton, Dickinson and Company launched the Genesis, a low temperature rigid sterilization container system, which provides long-lasting protection and sterility maintenance for surgical instrumentation. These key developments are likely to augment the global sterilization equipment and disinfectant market in the near future. However, high price of sterilization equipment and increasing demand for disposable devices are likely to restrain the global sterilization equipment and disinfectant market during the forecast period. The global sterilization equipment and disinfectant market has been segmented based on method, disinfectant type, end-user and region. In terms of method, the heat sterilization segment is projected to dominate the market. However, the segment is expected to lose market share during the forecast period, due to fewer opportunities for new entrants in the segment. Moreover, the heat sterilization method is not suitable for heat and moist sensitive equipment, the sterilization process damages the equipment. The low temperature sterilization segment is projected to expand rapidly at a notable CAGR during the forecast period. Demand for low temperature sterilization is increasing due to its advantages over the other sterilization method. The advantages include no corrosion in equipment for a long time, low temperature required, and easy to handle. These factors are fueling the segment. Based on disinfectant type, the oxidizing disinfectant agents segment led the market, in terms of revenue, in 2017. It is anticipated to maintain its dominance of the market during the forecast period. In terms of region, North America held a major share of the global sterilization equipment and disinfectant market in 2017. Rise in awareness about healthcare associated infection (HAI) and rise in number of surgeries are key factors propelling the market in North America. In terms of revenue, the market in Asia Pacific is projected to expand at a rapid pace during the forecast period, due to a rise in the number of surgeries in such a huge population. Rise in HAI and availability of advanced sterilization equipment in countries such as Brazil and South Africa are likely to boost the market in Latin America and Middle East & Africa. Key companies operating in the global healthcare associated infection market that are profiled in the report include Advanced Sterilization Products Services, Inc., Getinge AB, STERIS Corporation, Belimed, 3M Company, Cantel Medical Corp., TSO3 Inc., SAKURA SI Co., Ltd., Matachana Group, and CISA production srl. These players are adopting organic and inorganic growth strategies to expand their product offerings, strengthen their geographical reach, increase customer base, and gain market share. For instance, in May 2017, Matachana Group acquired an Italy-based company, METALARREDINOX, S.p.A., to expand its sterilization and disinfectant product portfolio and geographic presence. Sterilization is a vital component for infection-control. Medical devices require sterilization and disinfection after their usage, since they get contaminated. The global sterilization equipment and disinfectant market is expanding at a significant pace due to factors such as rise in number of surgeries and increase in number of hospital acquired associated infection. The global sterilization equipment and disinfectant market report comprises an elaborate executive summary, which includes a snapshot that provides information about various segments of the market. It also provides information and data analysis of the global market with respect to the segments based on method, disinfectant type, end-user and region. A detailed qualitative analysis of drivers, restraints, and opportunities has been provided in the market overview section. Additionally, the section comprises a competitive matrix and company profiles to understand the competitive landscape in the market. This section of the report also provides market attractiveness analysis by geography and market share analysis by key players, thereby presenting a thorough analysis of the overall competitive scenario in the global sterilization equipment and disinfectant market. In terms of method, the global sterilization equipment and disinfectant market has been segmented into heat sterilization, filtration sterilization, low temperature sterilization, radiation sterilization. The heat sterilization segment can be further segmented into dry heat sterilization and moist heat sterilization. In terms of disinfectant, the global sterilization equipment and disinfectant market has been classified into oxidizing and non-oxidizing agents. The oxidizing agents segment has been further sub-segmented into ethylene oxide, formaldehyde vapor, and others. The non-oxidizing agents segment has been further split into quaternary ammonium compound, phenols, and others. The method type segments have been analyzed based on different type of sterilization process carry out to kill microorganism and sterilize the equipment. The market size and forecast for each of these segments have been provided for the period from 2016 to 2026, along with their respective CAGRs for the forecast period from 2018 to 2026, considering 2017 as the base year. 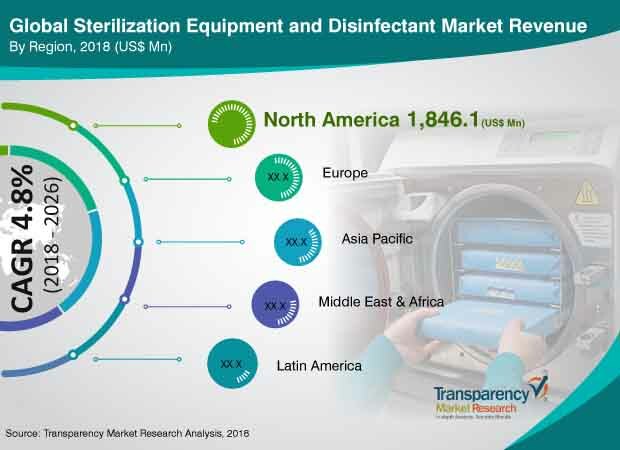 In terms of geography, the global sterilization equipment and disinfectant market has been segmented into five major regions and key countries/sub-regions in the respective region: North America (the U.S. and Canada), Europe (the U.K., Germany, France, Italy, Spain, and Rest of Europe), Asia Pacific (China, Japan, India, Australia & New Zealand, and Rest of Asia Pacific), Latin America (Brazil, Mexico and Rest of Latin America), and Middle East & Africa (GCC Countries, South Africa, and Rest of Middle East & Africa). The market size and forecast for each of these regions and the mentioned countries have been provided for the period from 2016 to 2026, along with their respective CAGRs for the period from 2018 to 2026, considering 2017 as the base year. The research study also provides the competitive scenario in these regions. The report also profiles major players in the market in terms of various attributes such as company overview, financial overview, devices portfolios, business strategies, and recent developments. Major companies profiled in the global sterilization equipment and disinfectant market include Advanced Sterilization Products Services, Inc., Getinge AB, STERIS Corporation, Belimed, 3M Company, Cantel Medical Corp., TSO3 Inc., SAKURA SI Co., Ltd., Matachana Group, and CISA production srl.